These sliders are a real peach. Sliders…..they are the best, aren’t they???!!!! Tiny little sandwiches that can help you stay on track by not overeating…..or tiny little sandwiches that you feel you need to eat ten of to eat an entire regular sized sandwich. Such a versatile food, right? For my Labor Day picnic I wanted to do something a little different than the usual cookout foods and thought about sliders. After some trolling around on Pinterest I came across this recipe that sounded delicious and selected it to be the slider recipe on the menu! In a slowcooker, place sliced onions and peaches, then top with chicken. Whisk together vinegar, bbq sauce, chipotle peppers, salt, and adobo sauce, then pour over chicken. Cover. Cook on low for about 6 hours . Use a fork or your Kitchenaid mixer (paddle attachment) to shred chicken. Serve on sliders topped with coleslaw (you can make your own or purchase). The coleslaw is a great accompaniment to the spice of the chicken! Food, food, food…..I love you! I know it is pretty clear if you follow me on social media, but I really love Mexican food, especially tacos. There’s just something about the flavors in Mexican dishes that make me happy!!!! Several years back I experimented with a dish that has become one of my favorites to make when entertaining because it is a) simple to make b) something that puts a spin on your regular stuffed shell recipe and c) absolutely delicious. Mexican Stuffed Shells! Yes, you heard right! I made these last week and posted some snaps on my snapchat and IG story, and so many of you messaged me or snapped me back asking for the recipe. Here it is, friends! Cook the ground beef as oven preheats at 350. Once beef is cooked, mix in cream cheese, taco seasoning, corn, and black beans if you are using. I have made this recipe both with corn and black beans and without, and I definitely prefer with! As you cook the ground beef mixture, bring a pot of water to a boil and boil the shells. It’s all about multitasking, friends! Use a 9 x 13 baking dish (I use a stoneware baker from Pampered Chef because I love how it cooks them), and pour salsa on the bottom of the pan to coat. Spoon meat mixture into shells and place in pan. Drizzle taco sauce on top of shells, cover with foil, and bake for 30 minutes. After your timer goes off, remove foil from shells and add shredded cheese, baking for another 15 minutes. Once completed, remove and top with sour cream and green onions. ***I provided the option of Greek Yogurt as a substitute for sour cream. This IS a recipe you can make healthier, and this is one of those healthier swaps. These are so tasty and are different….prepare to share this recipe because once you make them for friends, they are going to ask you for the recipe! I often get asked what I pair with these since your traditional garlic bread and salad may not go as well. I typically make homemade guacamole and chips! 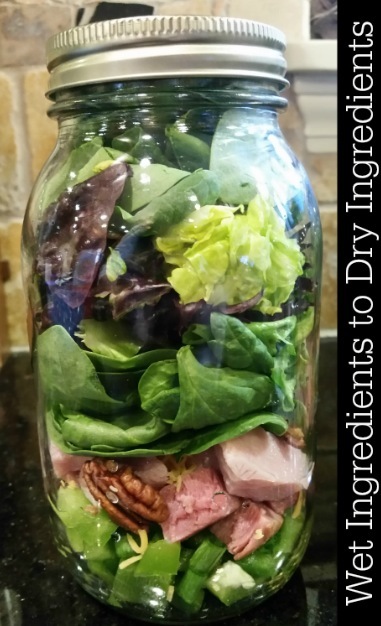 No great story ever began with a salad….until the salad met the mason jar. If you are someone who follows me on Facebook, you know there is one thing I do every single Sunday. 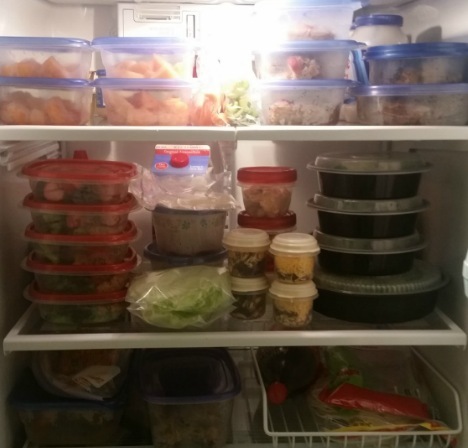 Back when I started my journey toward a healthier lifestyle, I learned quickly that one of the best things I could do was plan out my meals for the week and prep for them the Sunday before the week began. Initially it seemed like so much work, but after awhile I got into a rhythm where this weekly ritual became just part of my routine. So why meal prep? Im guessing a few people reading this are asking themselves that question. Let me tell you why I do it. I live an extremely busy lifestyle. As someone running their own business juggling multiple work projects all the time, including planning a wedding, I have no choice but to eat on the run most days. I refuse to eat at fast food restaurants, and it can be pricey to go to sit down restaurants constantly. Plus, let’s be real….I just like the way I cook, and I like to know what kind of food I am putting into my body at all times. Having meals portioned out properly and in cute little containers makes it easy to grab and go. – IT SAVES ME MONEY. You may think that it doesn’t, but trust me, it does. When I first started meal planning I went back through the previous month and tallied up how much I spent on random meal purchases, lunches with coworkers or my employees, or quick snacks from wherever I was. It disgusted me how much I spent. Having everything, including snacks ready, eliminates those mindless trips. When I grocery shop, I have a specific list, meaning I am not grabbing random things that aren’t good for my body or my wallet. -IT KEEPS ME ON TRACK. I have goals, and I am very conscientious of what I eat. My lifestyle has changed so much over the past couple of years. How I eat is not a diet; it is my way of life. We are only given one body on this Earth, and I am taking care of mine by making healthy choices in the kitchen. I won’t tell you that I don’t ever eat unhealthy things….because I do…I have a cheat meal every week, and I do enjoy ice cream here and there. Since I started meal planning I am more mindful of my choices overall. I like having a plan. I like sticking to a plan, and I like the results I see when I complete a plan. This makes me very, very happy to see. One thing that is pretty consistent with my meal planning is that I like to make meals that don’t necessarily take a long time to make. This brings me to the star of this blog article, my mason jar salad. Mason jar salads are great for anyone because they can be made about a million different ways. If you are a picky eater and don’t like a certain recipe, all you have to do is modify the recipe to meet your tastebud’s needs. I like to think of it as the perfect mix and match food item. The great thing about using a mason jar is the salad stays fresh much longer. Also, they look really cool, and it saves you from container chaos. Before, whenever I made a salad to go, I had separate containers with the cheese, the meat, a dressing if I had it…so many containers. (Sidenote: Mason Jars come in a variety of sizes and are very inexpensive. I got mine at Target). While you do have lots of options with this, there is a way you want to assemble everything, so consider this when planning out your salad. You want to start with wet ingredients and move up to dry ingredients, if not your salad can be soggy, and no one likes that. Here is how you want to assemble your salad. 1. Dressing on the bottom. Ive never been a huge dressing person, so this is often missing from my jars, like the one above. If you use a dressing, use about 2 tablespoons or so. 2. Hard Veggies are next. I love green peppers, so this is a staple for me, but sometimes I use broccoli, cucumbers or carrots. These hard veggies serve as kind of a barrier between the dressing and softer items to follow. I also add nuts to this layer if I am including them. This week’s salad includes some pecans toasted lightly with cinnamon and coconut oil. 3. Soft Veggies. Soft veggies include avocado, tomatoes, onions, corn, etc. 4. Protein. This is where you add your meat and cheese, as well as egg if you choose. This week I chose ham for something different. 5. The very last layer is for your lettuce. You can use spinach, arugula, whatever you choose! Tighten lid and refrigerate. They are that easy. 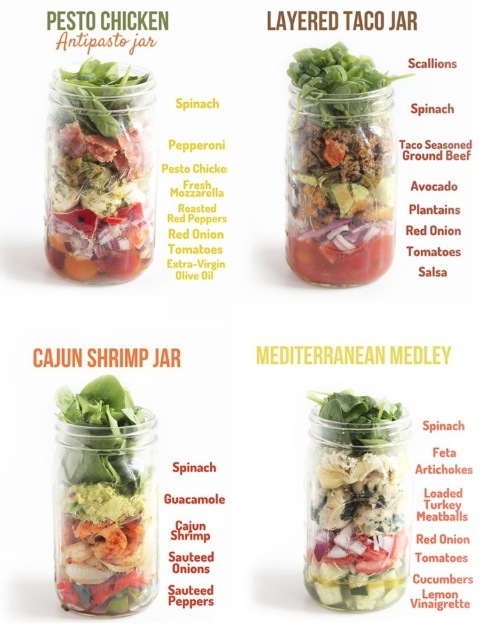 I’ve made many variations with my mason jars, but these are 4 of my favorites (minus the dressing). Pinterest has a variety of options, too, so if you are a pinhead like me, make sure you spend a little time cruising through the options. Another favorite of mine: strawberry vinaigrette, strawberries, mandarin oranges, blueberries, then grilled chicken, a little shredded cheese, some of my delicious pecans, and lettuce. Great for summer! Here are some fun things to keep in mind as you made your salads. -Do pack your jars super tight and leave as little air as possible. Less air means the salad stays fresher longer. -Do be creative….you can use pasta, quinoa, rice…whatever you like! Just always keep the lettuce/spinach/arugula at the top away from any wet ingredients so they don’t wilt. -Do make salads in an assembly line. It is easier to cut up everything and have it arranged in an assembly line for quicker processing time. 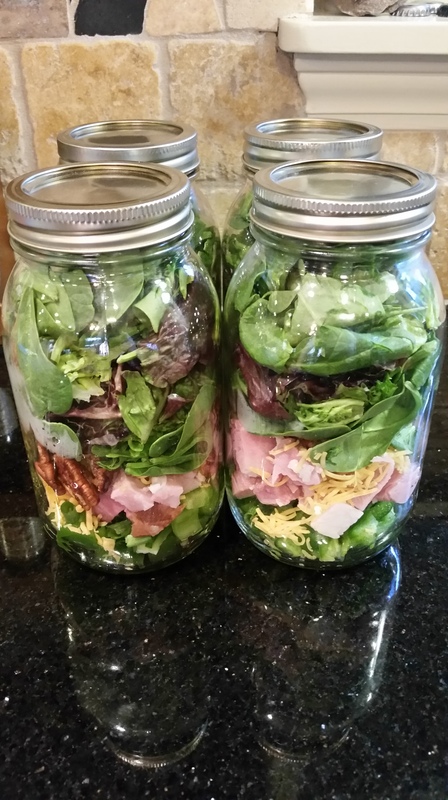 Also, don’t make just one or two salads……it is more cost effective to make a week’s worth. -Do stick with the same protein and change up the rest of the ingredients to be cost effective. For example, preparing chicken in bulk saves you money and can be modified many different ways. -Do buy your mason jars in bulk. Typically a dozen will run you about $10, and you can also use the jars for overnight oats, canning down the road, or other creative projects. Give meal planning a try, and make sure you add these bad boys to it!